The arrival of the New Year means “out with the old and in with the new”. From resolutions and goals to home décor and clothing, embracing the fresh start of a calendar year can inspire you to make changes in other areas of your life. If you are motivated to make new space in your living area this year, decluttering and organizing can make a huge difference. Often, our other obligations come before paying attention to our own living space, so dedicating time to assess and address your cluttered or over-packed home can set the tone for a fresh and clear mind in the New Year. Ready to begin, but not sure where to start? Having a hard time parting with your once-loved or infrequently used belongings? Consider renting an affordable and convenient storage unit near San Mateo. You can remove unwanted items from your immediate view and create new functional living space without the expense of moving to a larger place or committing to saying goodbye to your items for good. and carefully wrap the fragile ones before storing so that they are in good condition and easy to set up again next year. 2. 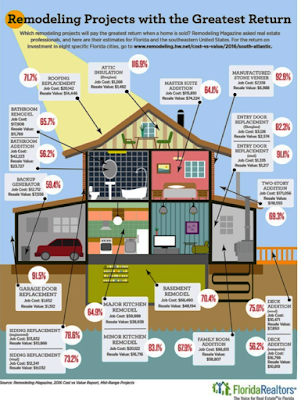 Go to the Garage – If you have a garage, shed, basement, closet, or other area of your home that has become a dumping ground for miscellaneous goods, start there. It can be a good way to tackle a lot of items at once and get a sense of what type of items have become forgotten or unwanted. Are you piling up a lot of gifts? Or maybe sentimental items have taken up residence in boxes? If your car has been displaced or your linens no longer have a home, consider moving those special but less functional or unused items to a storage facility. 3. Part with Belongings – Getting rid of things is one of the easiest ways to create less clutter and bring in a sense of clarity and direction to your living space. If you don’t use it, have forgotten about it, or simply don’t like it, now is the time to say goodbye. While some items are suitable for short or long-term storage options, others can be donated, reused, repurposed or thrown away. 4. Clean Out the Kitchen – The kitchen often contains broken tools, mismatched utensils, and unwanted machines or small appliances. If you gave up on juicing or only use your huge turkey roasting pan during the last months of the year, why not get them out of the way in a storage unit to wait until you do need them? Utilizing the efficiency of a storage unit, you can enjoy more shelf room, easier access to items you do use, and more counter space so that your kitchen can truly function well for you. 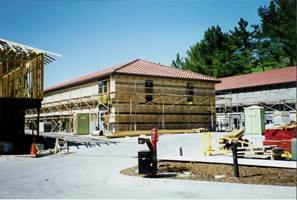 5A Rent-A-Space has many unit options for storage rentals near San Mateo, CA. Whether you have found big furniture or small keepsakes, our team can offer useful advice backed by 45 years of experience. Learn more about our storage units when you call (650) 338-0016 or reserve your unit online now. 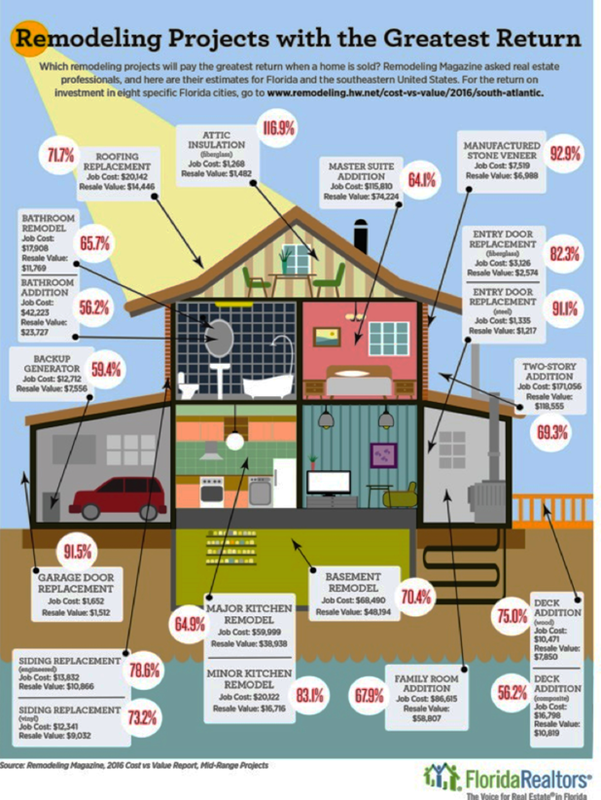 Your home does not need to be big to be comfortable, but sometimes we could all use a little extra space. If you live in an apartment or home that cannot accommodate all of your belongings, consider renting a storage unit near San Mateo. A storage space can give you flexibility and that needed extra room when it comes time to store festive decorations, start up seasonal activities, or retire weather-permitting hobbies. 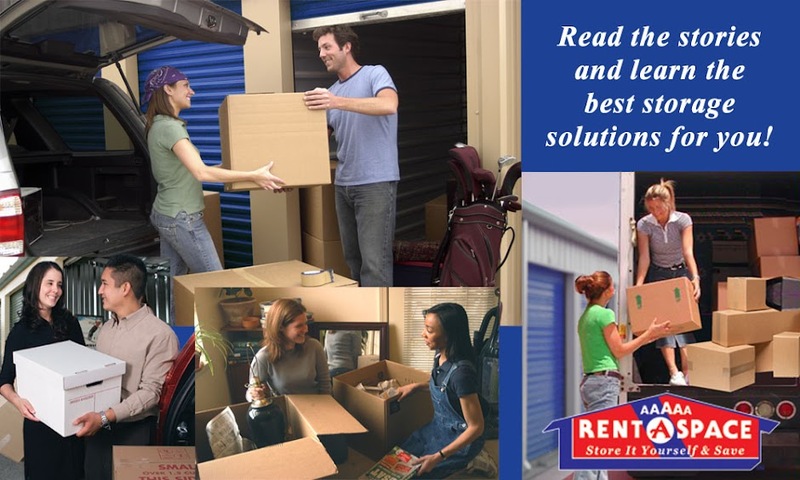 If you are interested in finding a flexible, affordable, and reliable storage solution, contact 5A Rent-A-Space to find the right unit for you at our facility. · Winter – Bulky clothing, festive decorations, and a lot of sports equipment you own may not be needed throughout the year. If you only require certain items during the holidays or during the cooler months, consider storing these items during the remainder of the year. Trees, lights, coats, skis and skates can all be neatly packed into a storage unit and retrieved when you need them. It can be tempting to throw everything into a box, but take the time to properly disassemble your tree, wrap your lights, and sort your clean clothing into appropriate protective storage bins. 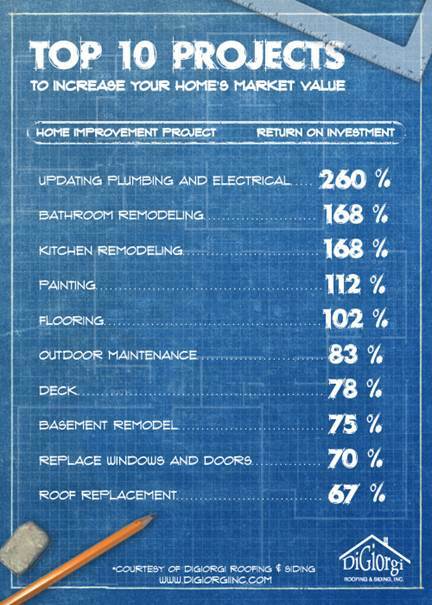 You will thank yourself next year as the busy holidays approach and your job is made much easier. · Spring – If you enjoy gardening but only find yourself maintaining the hobby throughout the spring and summer months, it may be wise to bring pots, soil, and garden tools into a storage facility in the winter. Out of harm’s way and out of your way, you may find you grow to love gardening even more. · Summer – Beach umbrellas, water toys, and summer sports equipment can be more appealing when you see them once a year, during a time when you can actually use them. If you are unsure how much room your off-season belongings will need, use our easy “Space Calculator” for a fast estimate. · Fall – Rakes, scarves, and Halloween or Thanksgiving decorations can all find a corner in your storage unit. Fall brings crisp air and heavier clothing, but you don’t necessarily need access to all your Thanksgiving feast tools or sweaters earlier in the year. Give them their own home but be sure to look at the calendar before packing things away. Place items needed at the end of the year in first. If they are located near the back, you can avoid climbing over everything in storage to retrieve the one thing you need! Remember to leave a walking avenue down the middle and mark the boxes and bins with their contents clearly, with bold marking pens, so you can find them quickly. · Consider sectioning off your storage unit so you have ample room for each of the 4 seasons of the year. You can even make a plot plan of where things are for easier retrieval. The more organized you are inside your storage unit, the more efficient will be your use of this valuable space. 5A Rent-A-Space can provide residents in San Mateo, CA and surrounding areas with storage units for seasonal belongings, keepsakes, or other infrequently used goods. 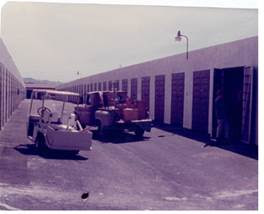 We have provided flexible storage options and a variety of unit sizes for more than 45 years. Check out our FAQs for more handy packing and storing advice or contact us today and let us help you with your storage requirements. Rent your storage unit from 5A Rent-A-Space by calling (650) 338-0016 or reserve your unit online now to ensure you have the space you need. 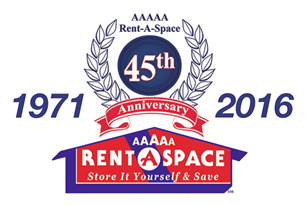 5A Rent-A-Space is celebrating 45 Years in Business!! 5A Rent-A-Space has been in business for 45 years. Our commitment to customer service has been paramount while providing a clean and safe place to store our customer’s possessions and treasures. As we reflect upon our anniversary this year, we remember our roots. During a slowing in the building and construction business, our founder, Jim Knuppe, had an opportunity to invest in a large warehouse with partitions. Out of a necessity to diversify his building business came this idea: to turn that warehouse with those partitions into a place where people could store their things. 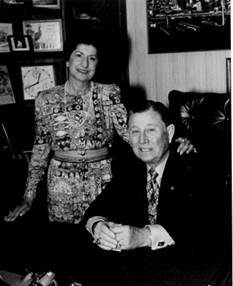 Some of our first customers in the early 1970’s were the Oakland Raiders organization. 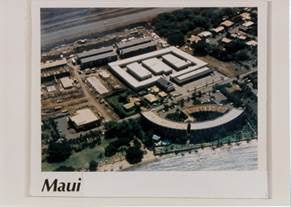 Currently we have locations in Foster City & Moraga, CA as well as Lahaina, Maui, Hawaii, with 3456 customers. Our company has since, also diversified into owning and operating Kcommons Executive Lease Homes. With three generations of family still owning and working for our company, it is our unwavering commitment to doing business with integrity that keeps our company strong and striving to do our best for our customers and our communities. We look forward to continuing to serve with the same integrity for years to come. 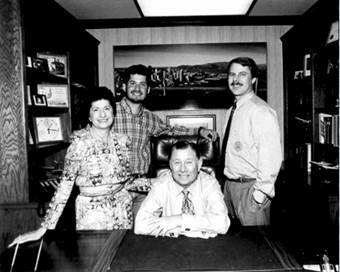 Our Deepest Gratitude and Thanks for helping us reach 45 years in business, from the 5A Family! 5A Rent-A-Space recognizes that the cost for basic school supplies has increased. 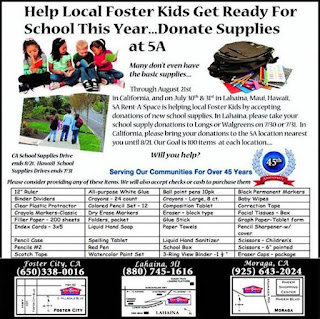 As a family run business, our goal is to assist our community's school age foster children to be able to do their best at school by hosting our 2nd Annual School Supply Drive. Our goal is at least 100 items at each location. Can you help? 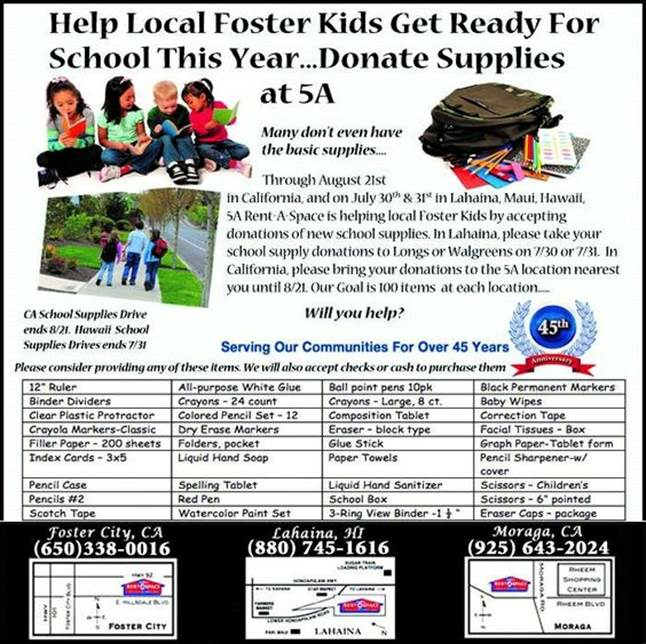 Our sites in Moraga and Foster City will be collecting school supplies until August 21st. Bring your donations to the front office at each 5A location. Over the past several years, 5A Rent-A-Space has increased our commitment to creating a smaller carbon footprint in our communities by installing solar panels on our buildings and hosting monthly recycling events. In 2015, 5A Rent-A-Space Lahaina partnered with the Rotary Club of Lahaina Sunset, Malama Maui Nui and the Lahaina Cannery Mall to create the "Go Green Third Saturday Recycling" program. On the third Saturday of each month, between the hours of 9:00am – 12:00pm volunteers from the Rotary Club of Lahaina Sunset and 5A Rent-A-Space meet in the parking lot of the Lahaina Cannery Mall to collect items to be recycled by local residents. Through this monthly program, we have assisted 1,828 residents and visitors to divert recyclables from the Maui Landfill. The following statistics are staggering when we consider the small group of volunteers who have put in over 450 hours to keep Maui Green. 689 appliances including refrigerators, stoves, dishwashers, washers, dryers, etc. 27,288 pounds of "traditional" recyclables including paper, plastic, glass, aluminum, etc.